When considering piano lessons for children, the first question parents usually ask is, "What's the best age to start lessons"? Of course, every child is different and some students at the age of five have no problem sitting in one place for 30 minutes, while others have a hard time sitting still for 30 seconds. 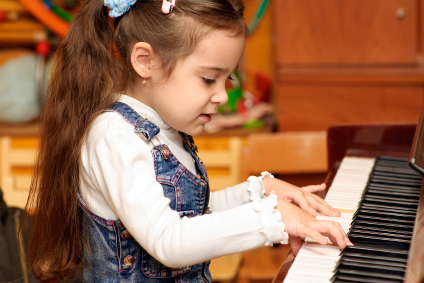 If your child does okay in a half-day preschool, then enrolling them in piano lessons is probably a sound decision. A few questions directed toward your child's preschool teacher as to their level of focus will definitely help you make a more educated decision. If you're unsure, it's always best to wait. A good indication that your son or daughter may be ready for private piano lessons is their level of interest. If they've asked you more than once if they can learn how to play the piano, that's a good sign. However, if you want your child to take lessons because your parents made you take piano lessons when you were a kid, or you believe that it will make them smarter, (and yes, studies have shown that learning a musical instrument makes you smarter), then you may be setting them up for an unpleasant experience. While learning anything new will make anyone smarter, forcing children to take music lessons for any reason except the one that really matters -- THEY REALLY WANT TO -- is never a good idea. We've had some parents call and ask to enroll their child in lessons at the age of 2- or 3-years-old. Now I realize that Mozart was composing at the age of four, but for most students, it's best to wait until they're at least five, and then you can start gauging their level of interest and ability to focus. Of course, knowing their ABC's will definitely be an advantage. Most piano primer books will introduce music notes with letter names within the first 6 to 8 lessons, and even then they only need to know the first seven letters of the alphabet. Piano lessons for children and be tricky, but with all of that said, there is one factor I haven't mentioned, and it's the one variable that can make all the difference. It's a rare occasion when mom or dad sits in on the weekly lesson and the daily practice sessions on a regular basis, but the few times that I've encountered this level of parental involvement, the results have always been good. If fact, directly below is a photo of a brother and sister who have a mom and dad who are actively engaged in their music education. They were Student's of the Month for July 2018 and deservedly so. 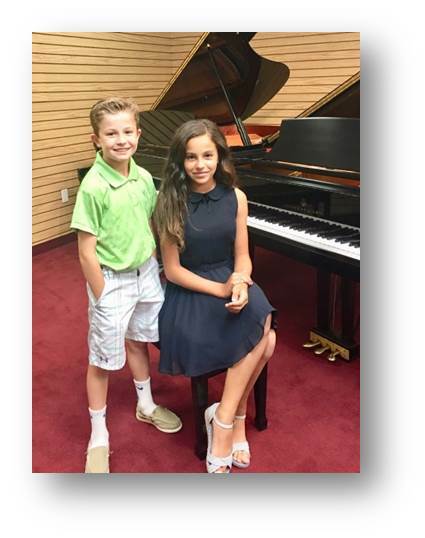 Julia and James Tourtellotte are well on their way to becoming exceptional pianists. Is it imperative to sit in on every lesson and practice session? Probably not, however, sitting in on a few lessons every month and a couple practice sessions every week will definitely produce amazing results. Click Here to read about Julia and James Tourtellotte.